Mix the mascarpone and the curd cheese together and put half the mixture in a separate bowl. 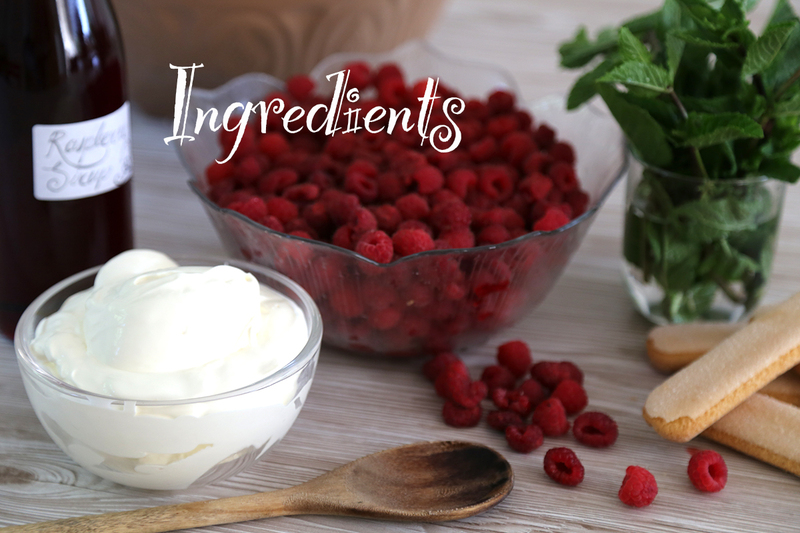 Stir in a couple of handfuls of raspberries and a dollop of sirup into to one of the bowls to create the raspberry creme. Lay the sponge fingers into the form (25x15cm) and soak with the sirup, spoon the raspberry creme over them and place another layer of sponge fingers on top, drizzle some sirup over the sponge fingers and cover with the creme from the other bowl (if you like it sweeter you can add some icing sugar). Decorate with raspberries and leave in the fridge for an hour or two to chill. Just the right after school/ homework treat! Maybe you should treat yourself too…. Wow, yes this tiramisu really looks divine !! There never was a bad version of tiramisu and raspberries are a great idea! What a beautiful day and beautiful meal. Looks amazing! Tammy, I am preparing for my next cooking class with my students, and this looks perfect. I know they will love it. Thanks for sharing. Thank you for sharing your recipe, it sounds so delicious! I’m definitely going to try it this weekend. I hope you will like my recipes as well. Yes,i have tried matcha tiramisu but with raspberry shd give a try. I haven’t tried a matcha tiramisu yet, but it sounds very intriguing! soon will upload the recipe. It was with the red bean paste layer and another layer with cheese and without the finger biscuits. It tasted awesome.